The Eastern Michigan University and the City of Ypsilanti have worked together to create a Google Map mashup that geotags crime in the area over the previous 60 days. This data can also be used with free illustrator designs: Free vector map USA, Adobe illustrator. Crimes shown on the map are categorised into arson, aggravated assault, burglary, criminal sexual conduct, motor vehicle theft, murder, robbery, and larceny from a vehicle. 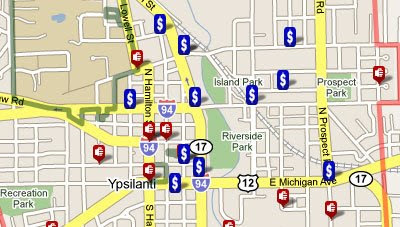 The university’s crimes are almost real-time, whilst crimes committed in Ypsilanti take a little longer to appear on the map. From the map sidebar it is possible to select which category of crime you wish to view, whether you want to view just crimes in the university or crimes in the city and the date range that you wish to view.